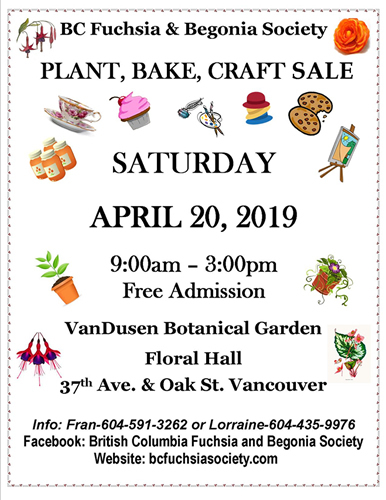 The annual “Plant, Bake and Craft Sale” has been set for April 20 at the Floral Hall of the VanDusen Gardens. FREE ADMISSION! Take this opportunity to pick up desirable plants at great prices! The Club will be setting up tables of fuchsia/begonia basket starters, and several individual members will be selling their own home grown plants as well. A variety of vendors will be joining us, so you will have a wide selection of other items to purchase at affordable prices! The vendors will be offering items such as: kelp fertilizers and products, homemade jams, art cards, “treasure trove” fuchsia and begonia lore, hand-painted china, “Brain Food Snacks”, Waterwikka products, handmade hats and other handmade crafts. Enjoy a coffee/tea along with some baked goodies as you shop!